The phenomenon that has become “Outlander” started with a series of seven novels written by Diana Gabaldon first published in 1991 through 2009. If you like historical fiction with a time travel twist then this series is for you. The first novel titled “Outlander” was inspired by an episode of Dr. Who, and her idea for the series and the characters evolved from there. With degrees in zoology and marine biology, Diana has a very interesting background, you can read about her here. In 2014 a television series based on the Outlander books premiered on Starz, and has been a popular franchise ever since. The fourth season “The New World,” premiered this past November 4. My daughter and I have been huge Outlander fans from day one. The story, time period, place, actors, costumes, music, we love it all. The series and music soundtrack kept her company on many nights in college while working on projects or writing papers and was my background music for many life drawing sessions. Now an actor and graduate of SCAD, Savannah College of Art & Design, she was recently invited back to the Savannah Film Festival that SCAD sponsors every year. 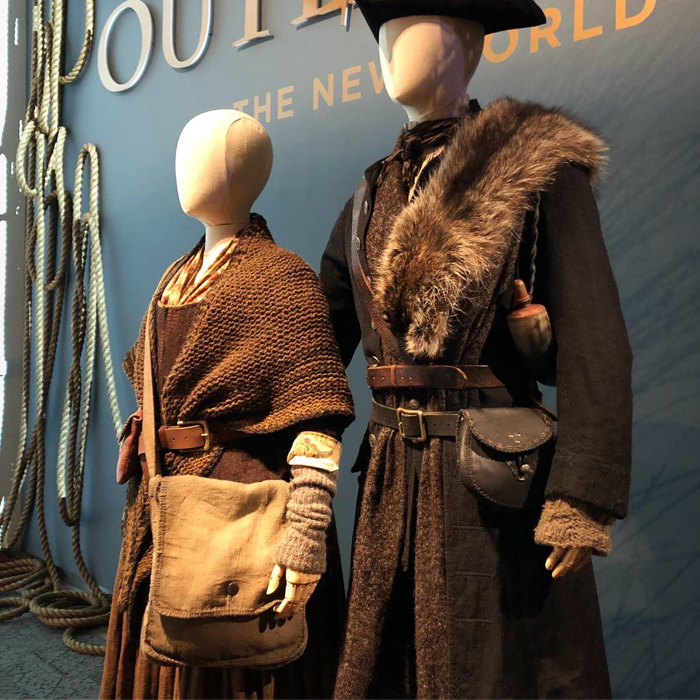 One of the highlights this year was the season four premier “The New World.” In conjunction with the premier was a Q & A with the cast and an exhibition of some of the costumes from the new season at the SCAD Museum of Art. 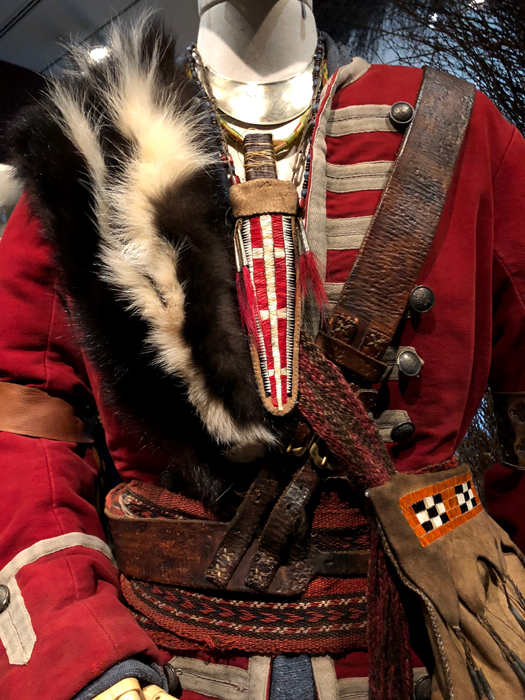 The costumes are designed by Emmy award winning costume designer, Terry Dresbach. As it happens, I was traveling to Charleston, South Carolina to pick up artwork from two shows I was part of this past summer and fall with WAM: Women Artists Mentors members at the Customs House Museum in Clarksville, Tennessee and The City Gallery in North Charleston. Savannah is just a hop skip and a jump away so I made detour to see the exhibition. Years ago I used to do textile art and a had a little part of myself that had the desire to go into costume design, but chose a different design path. It was a treat for me to study the show and get a little “Outlander” fix in anticipation of the new season. If you live in the area, the show closes on December 2, you still a little time left! A little tip: To all my fellow artists out there if you ever do go the the SCAD Museum of Art, just across the street is the SCAD book store, Ex Libres. Unlike any other college book store, it has three floors of art supplies! As SCAD has such a diverse range of majors, there are goodies in there that you won’t find in other art stores. Today I’m posting the second part to a previous blog post about Claude Monet and the book Mad Enchantment: Claude Monet & the Paintings of the Water Lilies, continuing my blog series on Monet, Giverny, and Other French Musings. As mentioned in my previous post, the Museé Claude Monet a L’Orangerie des Tuileries had opened to little fan fare, which was perplexing since Monet had become one of the most well know, and collected artists of his time. His long time friend, Georges Clemenceau, noted bitterly that a sign announcing a dog show in another part of the building was much more prominent than the one announcing the inauguration of the Museé Claude Monet in May of 1927, just five months after Monet’s death. Monet’s donation and the newly opened museum continued to plummet in popularity. The museum was poorly maintained the light quality was dismal and the oval rooms housing these great masterpieces were used for other functions. At one point, an exhibition of Flemish tapestries was hung in front of Monet’s paintings, water was known to leak down through the skylight and drip on the canvases, and one of the two rooms was used as a storage area. Monet’s godson, and son of artist Camille Pissarro, claimed Monet had been twice buried, once after his death and the second time with the opening of the museum. A retrospective of Monet’s work in 1931, supplemented by canvases that were in his studio when he died, brought even more scathing comments of his work and those of the Impressionists. During World War II, the L’Orangerie was bombed and one of the panels was damaged. The lack of concern was so great, the shrapnel wouldn’t be removed for another 20 years. The building itself was renovated in the 1960’s with another story added to the top eliminating the skylights that illuminated Monet’s work. This after the French Ministry acquired the Jean Walter-Paul Guillaume collections consisting of works by Picasso, Cézanne and Renoir. Essentially the magnificent water lily panels were relegated to the basement in a gloomy dark space. It wasn’t until after World War II that things started to change. The L’Orangerie became a place of pilgrimage for Americans, especially the American art students on the GI bill in the late 40’s and 50’s, who rushed to admire the Nymphéas by Monet. Ellsworth Kelly, an ex-soldier studying in Paris reached out to Michel Monet and Jean Pierre Hoschedé, Monet’s son and step-son to ask if he could visit Giverny which had been abandoned and was in disrepair. Monet’s studio still housed a number of canvases sharing the space with birds and other creatures. He produced Tableaux Vert now housed at the Chicago Art Institute as an homage to Monet and Giverny. In the 1950’s and 60’s American and Canadian painters kept Monet’s spirit alive living and working in the area around Giverny. American artist Joan Mitchell purchased and lived on a property in Vétheuil. The gardener’s cottage there had once been Monet’s home. Mitchell and the painters of the Abstract Expressionists movement were greatly influenced by Monet’s later work seeming to fit right in with the works of the time by Pollack, Rothko, and Mitchell. It is ironic that the renewed interest in Monet’s work would have been brought on by Abstract Expressionists, especially American ones. Monet disliked work of the Americans and “avant garde” contemporaries of the 1920’s. He did not want to see or have anything to do with Cubism and it probably would have gotten his goat that his works were being compared to the “Abstract Expressionists” of the 1950’s and 60’s. It was the renewed interest of this group that brought attention to his later water lily paintings and once again American collectors came to snap them up. 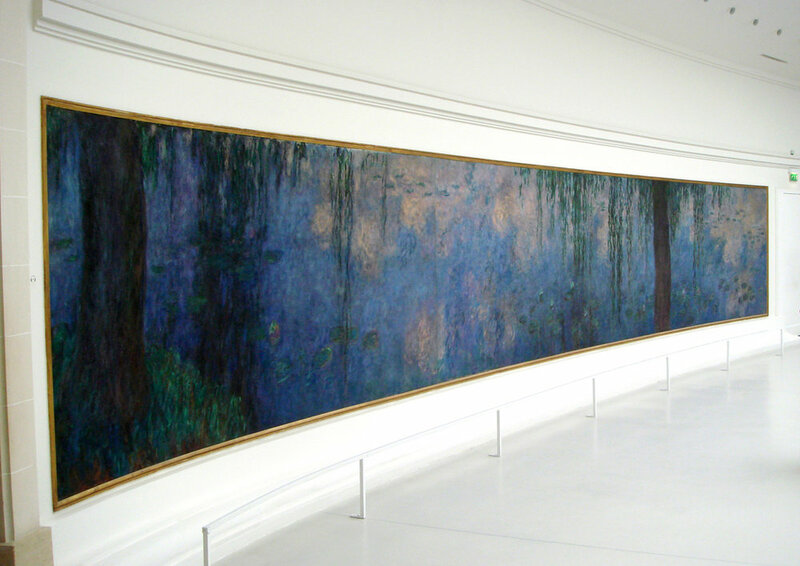 Walter Chrysler purchased a large scale water lily canvas for the Museum of Modern Art in New York. Unfortunately it was destroyed in a fire and was replaced by another work purchased from a dealer in Paris who had bought most of the remaining work of Monet from his son Michel. Word spread to American collectors as it had when Monet was alive. Joseph Pulitzer III, a passionate collector of modern art purchased a six foot wide water lily canvas in which he decorated his pool house at his mansion in St. Louis. Fast forward to 1996, the French Minister of culture at the time realized the curation of the placement of the Jean Guillaume collection to the Monet Nymphéas were completely backwards. The doors to the Musée de L’Orangerie closed in 2000 and a major renovation to the museum begin in 2003. During the demolition the paintings were hermetically sealed in reinforced boxes and temperature and humidity controlled. The second story added in the 1960’s was removed with the water lily paintings often being in distress, setting off alarms during the jack hammering of the demolition. The project would take six years and $36 million dollars. Now Monet’s Grande Decoration, takes the place of prominence lit with natural light from skylights above, just as Monet would have wanted it. The Guillaume collection is exhibited in the annex below along with a space for special exhibitions. I have visited the L’Orangerie before and after the 2003 renovation. Today, it is hard not to find a line stretching out the door into the the Tuileries Gardens. Avoiding weekend crowds, on cold gloomy winter days it became a place of meditation for me when I lived in Paris. Monet had come full circle, his grande vision of the space to house his last momentous project of his life, is appreciated and visited by thousands. Come back for the next post which will tell the story of a very peculiar visit to the L'Orangerie! I had such a magical trip to New York on so many levels! The highlight was attending the 151st American Watercolor Society's Exhibition and Award Dinner. I was so honored to receive the Winsor & Newton Award for my painting Maiko's Misedashi. The best part of the evening was meeting so many of the artists in the exhibition that I had only known on line. I loved being able to make the personal connections and share the joyous camaraderie with everyone! Here is a panoramic view of the upper gallery before the award dinner. I was like a kid in a candy store looking at all the work. Another view looking back toward the front entrance of the upper gallery. Out of a few thousand entries from all over the world the jury selects only one hundred and forty four paintings. Only thirty two paintings win awards. Winning this award will be one of the highlights of my art career. The exhibition and headquarters for the American Watercolor Society is at the historic Salmagundi Club, on Fifth Avenue just a couple blocks up from Washington Square, in Greenwich Village. This club is one the oldest art organizations in the country founded in 1871. A roster of former members include, George Inness, William Merritt Chase, Childe Hassam, Louis Comfort Tiffany, and Andrew Wyeth, just to name a few. Sir Winston Churchill is an honorary member. The club owns over 1,500 works of art spanning its, 147 years. It just reeks of history and you can feel it when you walk in the door. It is also one of the only surviving brownstones in Manhattan. One of my favorite museums to visit is the Neue Galerie where the famous "Woman in Gold" or "Portrait of Adele Bloch-Bauer" by Gustav Klimt is housed in an old mansion on Fifth Avenue on the Upper East Side. Seeing this work in person takes your breath away and I never get tired of seeing it. There are also some incredble pieces from the Wiener Werkstatte, Vienna in the museum. A highlight of a visit to the Neue Galerie is having lunch or a typical Viennese dessert. Within the museum is the Café Sabarsky, it really captures the interior and feeling of an authentic Viennese Coffee Shop! They are also open for dinner and feature cabaret shows on certain evenings of the month. While I'm on the subject of food, one of my all time favorite things to eat is Japanese Ramen. I will go on a Ramen quest to find a good bowl. This trip I returned to one of my favorite places, Momofuku Noodle Bar and tried a new place, Ivan Ramen. If you are Ramen obsessed and subscribe to Netflix you might enjoy The Mind of a Chef, Season 1 Ep. 1 featuring Chef David Chang of Momofuku Noodle Bar and Chefs Table, Volume 3, Ep. 4 featuring chef Ivan Orkin. I'm a huge jazz fan, and listen to mostly jazz, classical and world music while I paint. One of my bucket list to do's was to see Wynton Marsalis live. I got to check that one off my list this trip! He performed with his orchestra at Jazz at Lincoln Center featuring the music of Count Basie and Duke Ellington. The second half was solely Duke Ellington's Black, Brown & Beige, his longest most ambitious composition. Here is a link to a good recording I found featuring Ellington with Mahalia Jackson. No visit to New York is complete for me without visiting the Metropolitan Museum of Art, The Met. I’m always anxious to see the floral designs in The Grand Hall. Each visit I pick a certain area to focus on and really take my time. Temporary exhibitions get priority. This visit there was an excellently curated exhibit “Visitors to Versailles.” Stay tuned for a future blog post on that. This trip I went to The Met three times. It's like going to church for me. Another place to visit that is part of The Met is The Met Cloisters. I had a wonderful day there with my daughter Alaina. Located on 4 acres overlooking the Hudson River near 120th Street, it is the museum dedicated to the architecture, gardens and art of medieval Europe. The herb garden features only medicinal herbs or those used for utilitarian purposes such as dying cloth. Scottish Thistle seed pods were used as down for stuffing for bedding and clothing. The Cloisters are known for their collection of medieval unicorn tapestries. We just missed by eleven days the opening of the Costume Institutes 2018 spring exhibition at The Met, Heavenly Bodies: Fashion and the Catholic Imagination. This annual spring exhibition coincides with The Met Gala which is the Costume Institute’s Benefit which Anna Wintour, the editor-in-chief of Vogue Magazine co-chairs. This year will be her 20th Gala. The Gala is always held on the first Monday of May, the only day The Met is closed. Whenever I need an inspirational pick me up, I love to watch the documentary, “The First Monday in May,” made for the 2015 exhibition, China: Through the Looking Glass, which features Andrew Bolton, curator for the Costume Institute. This years exhibition will be the largest, featuring papel robes and accessories that have never left the Vatican and Catholic and religious influenced fashions from the worlds leading designers. The exhibition will be showing in three locations, The Met Fifth Ave Galleries, The Met Costume Institute, and The Met Cloisters. Here is a video in which Andrew Bolton, curator of the Costume Institute expounds on the exhibition and how designers have been influenced by Catholic imagery. One of the gowns not yet unveiled in the Medieval Art Gallery at The Met Fifth Avenue. Installation in progess in the Byzantine Gallery at The Met Fifth Avenue. As an artist and designer I always find fascinating where other artists and designers get thier inspiration and especially enjoy the behind the secenes curation of a major exhibition such as this. If you are as fascinated as I am and are a Netflix subscriber here is the link to the docuementary, "The First Monday in May." Select objects from the Vatian featured in the exhibition. Today is the first post in a series on my blog about Claude Monet, Giverny and other French musings. My favorite thing to receive as a gift is a good book. When I discovered Mad Enchantment: Claude Monet and the Paintings of the Water Lilies by Ross King, I couldn’t get it in on my Christmas list last year fast enough. King is also noted for Brunelleschi's Dome: How a Renaissance Genius Reinvented Architecture, and Michelangelo and the Pope’s Ceiling. King’s books are extremely well researched and Mad Enchantment is no exception. Focusing on the latter part of Monet’s life at Giverny, and his series of water lily paintings, including the “Grande Decoration” that would be the large paintings eventually ending up at the Musée L’Orangerie in Paris, it delves into his obsession with creating such an enormous oeuvre for an artist at his age. I discovered several things from the book that I never knew before about Monet. One is he would work on several canvases at once of the same scene while painting plein air. Essentially, they were a series of the same view captured at the moments in time before the light changed. As he was working on one canvas and the light had changed too much, he would grab the next one and work on that one for a while and so on. Sometimes even working on one for only seven minutes. It wasn’t uncommon for him to work in all weather conditions shuttling canvases back and forth and when he went on painting outings he was followed through the fields by his children and step children carrying canvases for five or six paintings of the same subject matter done at different times and with different lighting effects. He had a deep and long lasting friendship with George Clemenceau, the French Prime Minister during World War I. Clemenceau’s fortitude during the war helped the French get through it. Being one of the original architects of the Treaty of Versailles, he was instrumental in the war ending and getting reparations for the French from Germany. 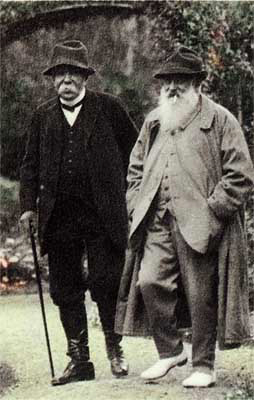 Clemenceau and Monet corresponded religiously. Clemenceau was a huge support mentally, emotionally and physically for Monet and his work. So it was right before World War I that Monet had the idea for the the larger than life canvases, he called “La Grande Décoration,” the series of water lily paintings that are now one of the most highly visited series of paintings in Paris at the Musée L’Orangerie. He painted them during the war while he was in his late seventies. While the enemy was close, on several occasions with their attacks on Paris and it’s environs, Monet never contemplated leaving. He would rather parish at his home with his work if it came to that. It was through his connections that he was able to garner favors for gas, so he could continue to use his cars, (he was a car collector), cigarettes, which he smoked like a fiend, and wine, which no French man can live without, during the war. Plus, he was aided with transport for all of the art supplies that he needed for his “Grande Décoration, " which would be coming from Paris. After Rodin donated his entire collection of sculptures and paintings to the French Sate on the condition that his workshop, the Hotel Biron and his home outside of Paris become museums, the seed was planted in Monet’s mind that he could too be honored in such a way by donating his “Grande Décoration” to the State, if they agreed to build a venue or museum to his exact specifications to house and display the series. Clemenceau was instrumental in getting the ball rolling and Monet started negotiations with the French State to make his gift a reality. But it was not smooth sailing and resulted in several tumultuous occurrences that everyone involved, including Clemenceau, wondered if it would ever come to fruition. Monet would tumble into fits of rage and depressions due to dissatisfaction with his work. He was known to take a knife slashing and then burning hundreds of canvases, not only the water lily works, but to those done through the course of his life. One panel in the collection of the L'Orangerie had to be repaired from the swipe of a knife. It is estimated that in his lifetime he destroyed more than five hundred canvases. Another obstacle was Monet's health. He wondered if his grand project would ever come to completion due to his failing eye sight due to cataracts. He had multiple surgeries on his right eye, with long difficult recovery times, plus trial after trial of prescription glasses that never seemed to work for him. Eventually he found the right lenses with a new scientific discovery, an instrument made by Ziess, that could map the surface of his eyes to create a lens that would be the best that he could get. Even those at first didn’t meet his satisfaction. He barreled down the rabbit hole into another fit of depression. After having surgery and multiple treatments on his right eye, his left eye was getting worse, and he refused to go through another bout of surgery, having suffered enough on those with the right eye. As he was finally adapting to his new way of seeing, he continued to work on the large water lily panels and was working with the architect on the design of the space that would eventually be their home. Originally it was planned as an addition to the Hotel Biron, Rodin’s museum. But when the architect fell out of favor for not meeting Monet’s specifications a new one was hired along with a search for a new location. It was then that the L’Orangerie, the former shelter during the winter for the orange trees of the Tuileries Gardens, during the time of the Third Republic, was considered. It had also been used for dog and agricultural shows and expositions, and was also a place for lodging immobilized soldiers during the war. Monet agreed to rennovating the L'Orangerie and the architect began drawing up plans according to Monet’s wishes for two oval rooms and a skylight to light the works. Time was of the essence because the French State was in an agreement with Monet and a date had been determined when Monet would hand over the work to be installed in the L’Orangerie around 1924. As time was getting close, he made every excuse to not follow through and canceled the donation. An exasperated Clemenceau was distraught and didn’t want anything more to do with Monet, and the situation almost destroyed their friendship. The underlying factor, on Monet’s part, was that he not only felt dissatisfied with the work, and that it was such a part of his “essence” he couldn’t part with the paintings while he was still alive. Even today in one of the panels there is an unfinished area, as if Monet couldn’t come to terms with completing them. After Monet died in 1926, the project finally came to fruition. Clemenceau was instrumental in making sure all of the details were addressed to open the L’Orangerie and dedicate the master works of his dear friend. The date of the dedication in May of 1927, and the opening of the Musée Claude Monet a L’Orangerie des Tuileries opened to very little fanfare. Clemenceau noticed that day that a sign for a dog show to take place at the same time in another part of the building was more prominent then one announcing the inauguration for the Musée Claude Monet. In fact art critics after his death didn’t hail him as a master artist. Because of the changing taste to more modern works at that time, they claimed the impressionists produced art that was essentially “fluff” and were postcards of niceties for American tastes. This, Monet’s momentous, glorious gift to the French State and no one seemed to care. By the 1950’s the L’Orangerie was essentially deserted and in disrepair. It is hard to fathom what went on in the L’Orangerie after the dedication of the Claude Monet Museum in 1927 and how it became what it is today. Stay tuned for Part Two of this blog post to find out, or grab a cup of tea, a comfy chair and a copy of Mad Enchantment: Claude Monet and the Painting of the Water Lilies. I created a few new mushroom paintings recently and a collector that owns two in that series contacted me to add to her collection to group four of them together. The more people that see this series, I learn that I am not the only mushroom fanatic out there! When I went to Montreal this summer I happened upon a shop that caters to nothing but mushrooms. They had dried to purchase for cooking, mushroom kits to grow your own, field guides and all sorts of accouterment for collecting while foraging for them. That was just the tip of the ice burg. On my birthday I was gifted a wonderful book, The Art of Beatrix Potter: Sketches, Paintings and Illustrations. It covers the history on how her famed Peter Rabbit series came to be, plus many tidbits about her art career and life. One of my most vivid childhood memories is when I had learned to read and started to check out books from my local public library. I devoured every tiny little green volume of Potter’s Peter Rabbit series and read them multiple times. Beatrix did so much more than write and illustrate these classic stories. Being from a wealthy family, the Potters took holidays every summer to various parts of the United Kingdom. The book is organized in sections geographically to give one the idea of what areas influenced her stories and art. Scotland played a significant role. It was there she became somewhat of a scientist and met Charles MacIntosh a well known amateur naturalist. Avoiding the strict formalities of Victorian society they established a long friendship and a study of Mycology (the branch of biology concerned with the study of fungi). Even after her return to London they would exchange notes on their observations of mushrooms. He would send her samples which resulted in beautifully rendered illustrations of mushrooms and her lengthy study of fungus. She spent many hours on location observing and creating stunning botanical illustrations in watercolor of the mushrooms and fungus she found and observed in their natural setting. She not only captured the mushroom itself but also it’s surrounding environment. Between 1894 and 1895 in a period of just one year she produced, seventy-three fungi illustrations and the following year fifty-two microscopic illustrations. Through her extensive observations and studies she came away with some remarkable discoveries. She tried to present her findings to the principals at the exclusive Royal Botanic Gardens at Kew, to only be dismissed because she was a woman. For another three years she would research spore germination, authoring a paper that was read to the male-dominated Linnean Society, they still refused to publish her findings. She had hoped that her illustrations and findings would be published as a book, to no avail she carefully stored all of her paintings and research. Seventy years later, a former president of the British Mycological Society discovered Potter’s treasure trove of illustrations of mushrooms, plants and fossils, and selected fifty-nine drawings for the Wayside & Woodland series, Fungi volume. Ironically published by Warne, the same publisher as her Peter Rabbit series of books. Many of her findings on spore germination that were dismissed were found to be true. I have a deep affinity with Japanese culture which I really can’t explain. I’ve had a self imposed study for many years on their food, customs, design, textile arts, horticulture, you name it. So when I finally had a chance to visit Japan, especially Kyoto, the old capital, on two separate occasions, it was a dream come true. I have had the idea for this painting floating in my head for a few years, and finally executed it. On one trip to Japan during cherry blossom season, we came upon a number of maiko, apprentice geiko, as geisha are known in Kyoto. The maiko in the painting was surrounded by lots of fanfare and was accompanied by her male dresser. Maiko must by assisted by a person, usually male, to help them layer their formal dress of kimono and tie the heavy and cumbersome obi. The obi is tied differently for the Maiko, leaving a long tail of the two ends down the back. For the geiko the obi is tucked in and doesn't hang loose. A Misedashi is a ceremony when a girl who aspires to be a geiko becomes a maiko, an apprentice geiko. It is the official beginning of her career. I wanted to integrate in the design my love of the textiles of Japan and pay homage to the art of ukiyo-e or wood block prints whIch I also adore. I used to do textile work for years and used some of those former techniques I used to do on fabrics in the background. Ukiyo-e literally translates as "pictures of the floating world" which describes the lifestyle and culture in the Edo-period of Japan when the prints were produced by artists such as Hokusai. The fish, or Japanese carp, in the design makes reference to the "floating world" depicted in this ancient art form, which also inspired many of the impressionist artists, like Monet and Van Gogh in the late 19th century. Monet collected ukiyo-e and Van Gogh was inspired by them as well and integrated elements from them in some of his work. Inspired by the lion statue outside the Basilica Santa Chiara in Assisi Italy. This symbolizes the essence and spirit of St. Francis of Assisi and his great love of animals and our duty to protect our earth's creaturesand environment. The background replicating a stitched pattern is an homage to the ancient art of Assisi Embroidery. I grew up in a small town in northern Indiana, called Logansport. Unbeknownst to me not more than 30 miles away was a small factory making handmade papers for stationary and watercolor. I drove by it many times on my way to Purdue University, where I went to college when I would drive home for a "home fix" and to have my mom make my favorite meals. She is an excellent cook, and I'm proud to say I have inherited her skills! When I started painting in watercolor I visited an Indiana artists at his home gallery and studio, Terry Armstrong. He was showing me some of his latest work and I loved the paper he was working on. It was Twinrocker. Then he sat me straight up when he told me it's made in Indiana, in Brookston! Thirty two miles and thirty-eight minutes from where I grew up! What are the chances of that? I always go and stock up on paper when I visit my mom. I blogged about one of my visits to Twinrocker, here. You can order a sample pack to try it! I love this paper for a variety of reasons. It's the only handmade made paper made entirely in the United States and I like supporting this business! I love the weight of the paper, the texture, and the type and amount of sizing on it. My preference is for the rough texture, but I have also used the cold press. I can't explain it but the paint flows differently on it than other papers I use. It's slightly more expensive but totally worth it for me! When things seem to fall into place so seamlessly, with no shenanigans so to speak, it was just meant to be. That's the way I feel about my recent trip to Italy with my WAM:Women Artists Mentors friends, Helen Beacham, Maria Bennett Hock, Debra Kierce and Carrie Waller. Helen approached us last summer and said, "Why don't I keep the apartment I'm renting an extra week after my students leave from my workshop and you all can join me in Venice!" We couldn't say yes fast enough. Research was done and flights were booked. Carrie traveled the furthest from Tokyo, Debra and Maria were coming from Virginia and myself from Florida. After we all booked our tickets, at the time we felt we would all get the best deal, we arrived in Venice within one hour of each other not really planning to, it just happened that way. I was first and waited for Carrie, Maria and Debra. We took the Alilaguna, airport boat, and met Helen at the stop that was 5 minute walk from the apartment. This was the first time everyone in the group was meeting in person! Since we all meet on-line once a month it instantly felt like we had met before many times. However, meeting on-line and traveling together are two different animals. But since we all look out for each other supporting each other in our art careers and business, we did the same as traveling buddies. Aside from a couple of incidents with pigeon poop, on the same person, I'm not mentioning any names, the trip was absolutely perfect. The thing that strikes me as being so wonderful about spending more than just a couple of days in Venice, is it's so relaxing! Granted it's not a beach vacation, but the ambiance is so special with no cars, sirens, or motorbikes, only echoes of people bouncing off the buildings in the narrow alley ways, the occasional church bells, and the sounds of boats going about their way on the canals. I think we may have been there before the tourist rush of summer, it didn't feel too crowded. 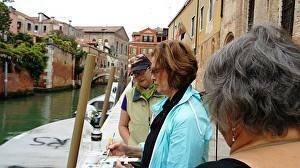 We had plenty of time to explore the 6 neighborhoods as well as Burano and Murano, as well as sketch, eat, (more than a few gelatos were consumed) and just spend quality time getting to know each other better. We all took thousands of photos between the five of us and I can't wait to see what we all are inspired by when we create some new work. So Cin Cin to my fabulous five friends, here's hoping we have many more adventures like this one! On a side note, Debra put together a nice memento and some advise on starting your own mentoring group on Bored Panda, click here. Almost a year ago I had the great opportunity to be a part of something, that I had no idea would have such an impact on my life. I feel some serendipitous energies were working behind the scenes to make it all happen, because it was just meant to be! I became friends with artist Carrie Waller on line a couple of years ago. I love her work and followed her blog where she had posted about a situation entering a show and not getting in because the juror or selection committee had rejected her painting. They thought she had infringed on the Ball trademark in one of her Ball jar paintings. Based on my experience with these issues in art licensing, I wrote to her and told her that wasn’t the case at all and after a bit of correspondence, she asked if I would write a couple of articles on her blog about trademarks and copyrights. That led to me doing one of her Friday Features and an awesome on line friendship. Me Working on My Current Painting at the Mennello Museum of American Art, Orlando, Florida, in Conjunction with the Mary Whyte Exhibition, "A Portrait of Us"
Through a somewhat serendipitous journey we came together and although we weren't all the original members, I'm the newbie of the group, we have gelled into the membership we are now. We all bring different things to the table with our varied backgrounds and experiences. We all live in different parts of the world which hasn't stopped us from meeting once a month through Google Hang Outs. We have set goals and guidelines on how our group will work and we are all equals, no one person holds a leadership position. We agree on a topic to discuss and get together once a month on a video chat, to talk to and support each other. Ironically Debra and I have a connection in that we both have lived and worked in Indianapolis at a pharmaceutical company, she as a Chemical Engineer, and me as a Corporate Space Planner. It would have been crazier if we had been there at the same time, but we just missed each other! Debra Kierce's Painting "Rollover Beethoven" SOLD at the Randy Higbee "Six Inch Squared Show, which Carrie, Maria and I are also in. Some of the things we have discussed are future WAM goals retreats and workshops, pursuing group shows in gallery and museum venues, what is and isn't working for us on social media marketing, and anything one of our current members might need help with at the time. The extra bonus of it all is, we have all developed such a close bond and amazing friendship that I know will last a lifetime. I'm honored to be a part of this group and cherish all these ladies and am so happy they are part of my life! Today we had the amazing opportunity to talk about our group on the Artists Helping Artists Radio show, hosted by Leslie Saeta. Here is the link to the show, "How to Be Part of a Successful Artists Mentoring Group." Like Debra mentioned in the show it gives us goosebumps to think that we may be helping other artists to create something like we have. For us it has been somewhat of an extension of the AHA show but on a deeper personal level since we see and talk to each other in cyberspace all the time. As we mentioned in the show we are beyond excited to finally all meet at the same place and in person in Venice, Italy this spring! Helen will be teaching a workshop there as she has been doing for years, and we are piggybacking on at the end to stay in the apartment that she rents. This is a priceless journey we are all on together! I cherish the friendship and support from these artists and know that I can seek guidance from them at any time! Please Visit and "Like" our Facebook page at Facebook.com/WAMArtists to follow our adventures. Debra will be hosting some amazing workshops with well known artists at her home studio you kind find more information about that here. She also did a blog post about our WAM group. Maria has been painting at the National Gallery as part of their copyist program, as well as working on a series of military inspired figurative and portrait pieces. She also graciously will do for free a portrait of a fallen loved one in the line of duty for their families. You can contact her here. Helen is an amazing teacher and watercolor artists and conducts workshops to European locations every year. She also just finished a series of very large, for watercolor, commissions for a couple in her area of Charleston, South Carolina. You can find out more about Helen and her workshops here. Carrie, has had some amazing success recently with her acceptance into the Shenzhen Small Works Exchange with the National Watercolor Society. She currently has a painting at that show in China, and recently received an Honorable Mention Award in the Southwest Art Magazine, Artistic Excellence Competition. You can find out more about Carrie here. Carrie’s Painting, "Out to Sea," in the Small Works Exchange Show with the National Watercolor Society in Shenzhen China. We are all personally on all the social media sites, just give us a search and like or follow us! A few of us have blogs, you can check those out too via our web sites. You can also leave a message on our WAM Facebook page if you have any questions about forming your own artist mentor group beyond what we discussed in the AHA show. If you are thinking about it we highly encourage you to just do it! You will have the opportunity to make friends for life and go on wonderful journeys together! And last but not least, thank you to Leslie Saeta for giving us the opportunity to share about our WAM group on the Artists Helping Artist Show, we hope we have inspired you to form your own group as she has inspired us to create ours! Mary Whyte’s exhibition “A Portrait of Us” opened this past weekend at the Mennello Museum of American Art in Orlando, Florida. Iwas beyond excited to see her work in person, since I’m a big admirer and have read most of her books, (see book reviews here), but then to meet her during a gallery talk on Saturday was an incredible opportunity! Mary is the nicest and most beautiful person as her paintings are stunning. She shared a bit about her background and how she came to paint the Gullah womenon John’s Island in South Carolina, as well as a brief story and sometimes a bit of technical insight on every painting in the exhibition. In addition her husbandSmith Coleman, Smitty, was there to discuss how he complements her work with the frames he hand makes, and the process that goes into carving and finishing the frames to enhance the paintings even farther. All of Mary's paintings were framed by frames made by Smitty. The frames as well as the work were absolutely beautiful. Knowing the stories and the thought process that went into each work gave me an even bigger appreciation of what I was seeing. It was such a unique opportunity to experience the artists giving a narrative of every piece in the show! I loved one thing Mary said when discussing her work and that was, “What do you want the piece to say, and then how can say more.” Something to keep in the back of my head while composing and painting my own work. Mary talks about how she composed these two works and the stories behind them. The show will be running from now until January 3, 2016. I plan to go back again since I know I will have a different experience another time. This show is not to be missed especially for artists who paint in watercolor!